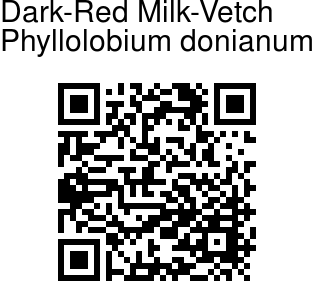 Dark-Red Milk-Vetch is a perennial herb with stems prostrate or rising 15-30 cm, hairless or sparsely velvet-hairy at first. 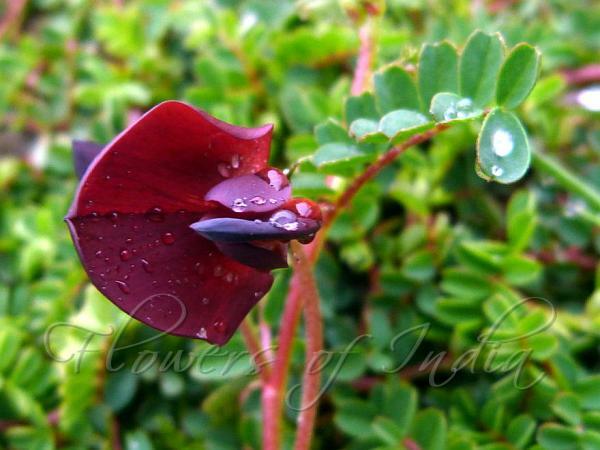 Flowers are dark red to deep brownish purple, shaped like pea-flowers, 1-2 on flower-cluster-stalks as long as leaves. Calyx is 7-8 mm, divided to middle into ovate-tapering teeth, black velvet-hairy. Petals are 1.3-1.8 cm, standard nearly round, blade 1.1-1.3 cm long and broad, wings oblong 9-10 x 2-4 mm, keel crescent-shaped 10-12 x 4-5 mm. Ovary is velvet-hairy, style bearded near the tip on the inner side. Leaves are compound, 2.5-5 cm long, leaflets 7-13, obovate-oblong 5-6 x 3-4 mm, notched at tip, base rounded, hairless above, appressed velvet-hairy beneath, stipules ovate 2mm. Pods oblong, 1.7-2.2 x 0.8-1 cm, inflated, nearly stalkless, tapering at tip into long fine point 8-10 mm, finely velvet-hairy, 12-16-seeded. Dark-Red Milk-Vetch is found in Eastern Himalayas, from Nepal to Bhutan, Sikkim, NE India, Tibet, China (Yunnan), at altitudes of 2900-4500 m.
Identification credit: Johan Nilson, H.B. Naithani, Lal Babu Chaudhary Photographed in Yumthang Valley, Sikkim.